Editor’s note: In celebration of the Thanksgiving holiday tomorrow, we hope you enjoy this week’s devotional selection from the late Rev. Billy Graham on thankfulness. It is a powerful reminder that no matter where you find yourself this Thanksgiving—whether a valley or a mountaintop—there is much, much to be grateful for. God promises no easy life or days without troubles, trials, difficulties, and temptations. He never promises that life will be perfect. He does not call His children to a playground, but to a battleground. Some people have a warped idea of living the Christian life. Seeing talented, brilliant Christians, they attempt to imitate them. For them, the grass on the other side of the fence is always greener. When they discover that their own contributions are more modest or perhaps invisible, they collapse in discouragement and overlook genuine opportunities that are open to them. Be like the apostle Paul and say, “None of these things move me.” Few men suffered as Paul did, yet he learned how to abound and how to be abased. He learned to live above his circumstances—even in a prison cell. You can do the same. Refuse to permit circumstances to get you down. In the midst of your difficulties, there will be a deep joy. “For the joy of the Lord is your strength,” says the Bible. Believe it or not, this is the path to peace. Paul said, “Troubled on every side, yet not distressed; we are perplexed, but not in despair; persecuted, but not forsaken; cast down, but not destroyed” (2 Corinthians 4:8). All these qualities are characteristic of true Christians. They can be yours, giving you the ultimate victory. They are part of your birthright. Claim them! 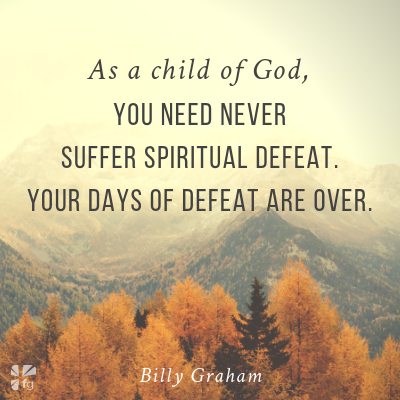 As a child of God, you need never suffer spiritual defeat. Your days of defeat are over. From now on, you will want to live every minute to its fullest. Certainly, you will welcome each day as another twenty-four hours to devote to Christ. Every new day will be filled with opportunities to serve others. You will spend many moments with God, and you will know that your sins are forgiven and that you are on the way to heaven. I wonder if I could be that thankful. Could you? Excerpted with permission from Unto The Hills by Billy Graham, copyright Billy Graham. What are you thankful for today? We’d love to hear from you in the comments! Billy Graham, the world-renowned author, preacher, and evangelist has delivered the gospel message to more people face-to-face than anyone in history and has ministered on every continent of the world; millions have read his inspirational classics.